This morning we left Clifden in pouring rain, nipped through Galway City and then continued on our way to County Clare - a journey of about 125 miles. And because of the initial bad weather we didn't really stop off much, but we did catch glimpses of some of the sights. The small fishing village of Roundstone cropped up quite early in our trip, and just after it we found ourselves admiring Dog's Bay and Gorteen - these are said to be 2 of Ireland's finest beaches and they are unusual in the fact that they lie back to back, and are only joined to the mainland by a thin neck of grassy dunes. Then as we continued on our way the terrain became strewn with rocks and boulders, along with numerous land locked lakes and salt water inlets - which was all very beautiful in a barren sort of way! But by this time we needed feeding, and once again there seemed no where to stop for lunch! The road was only nearly wide enough for two vehicles to pass, and for much of the time the verges dropped away into deep gullies so there wasn't any opportunities to pull over! But then, all of a sudden, T4rdis2 took a little detour and landed on a patch of rough ground beside one of the lakes, and as by now the sun was shining, this spot proved to be another lovely dining room! But all too soon it was time to resume our journey cos we still had quite a few miles to travel before reaching our next resting place. On this leg of our journey we found ourselves passing through The Burren - an area of exposed limestone that covers the north of County Clare. Apparently, this unusual landscape (which is known as Karst) was formed about 340 million years ago when this part of the earth's crust was the bed of a shallow tropical sea. Now the limestone lies in big slabs with intersecting cracks making it look as if huge chunks could fall away without warning! We finally arrived at our destination, which was Nagle's Campsite near Doolin about 5ish - we chose this site because of it's sea views and also it's distant views of The Cliffs of Moher. And we weren't disappointed - it's position is quite idyllic and as we can see crashing waves right from our windows we've decided to make it home for the next 3 or 4 nights. After we'd had our regulation cuppa we pottered down to Doolin pier from where the ferries depart bound for The Aran Islands, and there we were treated to more views of the Burren landscape, along with more waves on the incoming tide. Today our target was The Cliffs of Moher - a there and back walk from the camp site of about 10 miles - and almost every one of them was quite spectacular! Our walk started by passing through the little hamlet of Doolin where we found loads of quaint eateries, pubs and crafty shops - however John did drag me very quickly past the hand made chocolate shop - so all I got was a sniff! The only bit we weren't so keen on was when we got nearer to the visitors centre for The Cliffs of Moher, because here it became quite overpopulated - and the main interest of many of the visitors was posing and taking pics with their selfie sticks! Mind you, we shouldn't really complain cos entry to the area is supposed to be 6 euros, but as we'd come via the cliff path nobody asked us for any money so our visit turned out to be free! However, it was so busy we decided against having our picnic lunch there, instead we backtracked a little and left the madding crowd far behind before finding a ledge on which to perch (along with the birds) while we nibbled our sarnies. Then we started our homeward trek, but with very frequent stops to indulge in a little 🌊🌊🌊 (wave) watching - with the incoming tide the awesome power of the sea literally threw the waves against the cliffs causing huge plumes of spray to ricochet into the air - it was a very special sight to behold. Then, as we neared the end of the cliff part of our walk we heard a strange roaring noise and at first we couldn't decipher what it was - it turned out to be a blow hole with a sea cavern underneath where we were standing! As the waves washed in the air whooshed out with significant force - enough to make me squeal when I stood over it! Our walk was finished off by going back through Doolin Village - and it was here that I got my own back for missing out on the chocolate earlier - John was quite tempted to nip into one of the pubs for a swift Guinness, but I dragged him by and all he got was a 👃👃👃! And it was a good job, because we only just made it back to T4rdis2 before the winds picked up and the deluge started - as we've sat and scoffed our dinner in a rocking ship we commented that we were very glad we weren't still up on the cliffs in this lot! Saturday 10th June 2017 - A lovely mostly sunny day but ever so windy! Cycling was the order of the day for today and in this area there are 4 signposted cycle loops that we could have chosen from, but in the end, although we used part of Route 4 we did it the opposite direction to what is suggested, and we diverted from it quite a bit to see more of the coast. So to start what was to be a 32 mile ride we turned inland and followed a quiet road that took us past Doolin Cave (where the largest stalactite in the Northern Hemisphere resides), and then we rode on into the stunning Khyber Pass which passes through the Caher Valley. There, for our added pleasure, we had the rushing tumbling waters of the Caher River right beside us to keep us company, and also on each side the barren limestone hills rose steeply to rocky plateaus. 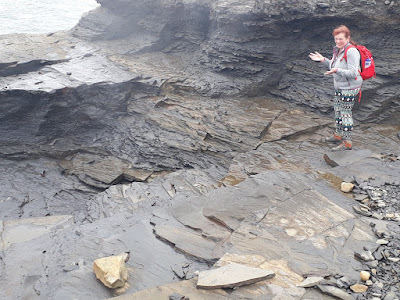 the bizarre landscape of the Burren up close, and allowed us to see the deep fissures in the limestone that were originally thin vertical veins of calcite which have since been dissolved away by rainwater. Apparently, the fissures are called 'grikes' and the blocks of limestone are called 'Clints'. There were also lots of boulders - but they were granite rather than limestone - and have been deposited there by the action of the winds and tides. Those in the picture don't look too bad but there were some balanced on the cliff side that looked as if they could roll down at any moment! By now it was lunch time, but the wind was howling powerfully, so we didn't really want to stop out in the exposed part of the Black Head Coast and risk our sarnies getting blown away, so instead we backtracked to a little spot we'd noticed earlier - It hadn't got very good views but it was sheltered and provided a water pump, a limestone table and benches, and someone even appeared to have put a tea pot out ready for us! Then after we'd eaten we started to make our way home, but by now the wind seemed to have gathered even more force, and it seemed fairly determined to make our peddling against it as hard as possible - even when we were going downhill we still had to keep pushing our wheels round to prevent us from becoming stationary! Sunday 11th June 2017 - A very very very windy day along with some heavy downpours! This morning we decided to move on - for 2 reasons really - the first being the terrible internet connection at Nagel's campsite that wouldn't let me log on to tell my story, and the second - the prediction of Gale Force 8 winds. Our spot on the campsite was very exposed and the van had rocked quite alarmingly on several previous occasions over the last couple of days, so therefore we didn't want to risk things getting any worse! The other worrying factor were the hooks that were embedded into every concrete pitch - they were for tying your van down in high winds! So with that in mind we picked out a more sheltered spot a little further down the coast at Doonbeg, and that is where we'll be residing for the next few days. We're now located in a tiny bay but still right on the edge of the water, and with shrubby trees all around us we're much more protected. Our position however, is still quite ideal for exploring this next section of The Wild Atlantic Way so I'm sure either our walking boots or bikes will be put to good use tomorrow.